Summer savory is an annual plant; the branching root produces a bushy, hairy stem which grows from 1 to 1 1/2 feet high, often taking on a purple hue as it matures. The opposite, small, oblong-linear leaves are sessile or nearly so, gray-green or bronze-green, on many-branched stems and may have hairy margins. The small pink or white, two-lipped flowers grow in whorl-like cymes from July to October. The entire plant is strongly aromatic. Winter savory is an evergreen perennial species, 12-16 inches high, more woody and bristly than summer savory. It branches profusely from the ground up and produces lanceolate, pointed leaves on more or less hairy stems. Lilac to white flowers are borne in the leaf axils. It has the same medicinal properties as summer savory but the leaves are stiffer than summer savory, and more aromatic, with a stronger peppery thyme flavor. They can both be harvested fresh all year. Calamint (S. arkansana) is a creeping perennial 4-8 inches high; leaves are oval at the base of the plant; the stem leaves are linear with oil glands on them. Leaves are strongly pennyroyal-scented. The flowers, 3/8 inch long, are purplish, two-lipped and bloom in April to July. Found in rocky glades from western New York to Arkansas, Texas; north to Illinois and Indiana. Used as a substitute for American Pennyroyal (Hedeoma pulegioides). Jamaican Mint Bush (S. viminea) is a woody shrub that grows up to 6 feet tall. 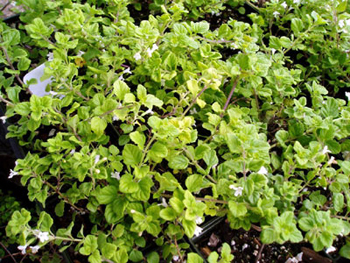 Mint bushes are popular in Jamaica for teas and to relieve indigestion. Grows wild in the Mediterranean area and is widely cultivated elsewhere as a kitchen herb. Both Winter and Summer savory have a pleasant, piquant flavor, though winter savory is stronger and more resinous. Used similarly, both are best known for their use with vegetables and all types of beans. Known as “bean herb” in Germany, the savories not only give flavor but cut down on the gas produced by beans. They also eliminate the strong odors in cabbage and turnips if you put 2 to 3 leaves in the cooking water. Best used fresh; must be home grown. 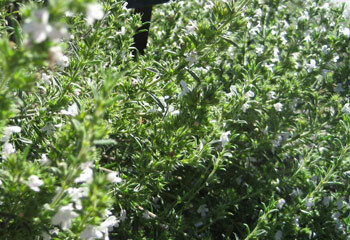 Summer savory probably originated in the regions around the Black Sea and the eastern Mediterranean. Benedictine monks brought it, along with many other potherbs, across the Alps to Europe, and Charlemagne, in his Capitulary on the management of his landed estates, ensured that it found its way into the gardens of monasteries and peasants’ farms. In the Middle Ages, Summer savory grew in every monastery garden and still today it is prized as a kitchen herb. It was used for seasoning and as a remedy, and Abbess Hildegard of Bingen, Germany, a reputable medieval herbalist and recognized as such even in modern times, recommended savory as a valuable herb. The leaves are used in seasoning, sometimes combined with sage. Anyone suffering from low blood pressure (Hypotension) would do well to use savory in addition to hyssop in the preparation of food. This herb was also highly valued in the Middle Ages because it was thought to stimulate the gonads. Summer savory was known to the Romans, who used its hot, pepperlike flavor to season dishes before other spices were widely used. The tea is a safe remedy for most stomach and intestinal disorders, including cramps, nausea, diarrhea, gargle for sore throats, colds, asthma, suppressed menses, flatulence, colic, chest congestion, and lack of appetite. Savory is said to have aphrodisiac properties. The oil dropped onto a tooth will relieve a toothache. The juice heated with oil of Roses, and dropped into the ears, eases them of the noise and singing in them, and of deafness also (so Culpeper claims). Externally, a poultice of savory and wheat flour eases sciatica, and palsy, heating and warming them, and takes away the pain. This poultice also takes away the stinging of bees, wasps, etc. The uses of savory are similar to those of oregano and marjoram. Known to the German as Bohnenkraut, beans and savory. Winter savory has the same medicinal properties as summer savory. Infusion: steep 2 to 4 tsp. dried herb in 1 cup boiling water. Take 1 cup per day, a mouthful at a time.